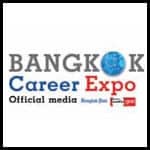 The Post Publishing PLC will present Bangkok Post Career Expo 2010, a grand year-end job fair where job seekers can either pre-register the application forms and upload portfolios at home or register at the fair. Job seekers can simply use mobile phone number to print out a bar code card to use at the event. Zones include Career Creative Zone, Training Zone, Franchise Zone and Main Stage. English tips will be taught by top teachers : Kate and Christopher Wright, as well as visitors can learn from experts how to do part-time job by making hand-made products. In the Self Interview Recording Room, job seekers can make video resume clips for immediate job applications. Plus a lucky draw of registered cell phone numbers for prizes including IPhone 4 and Samsung Galaxy Tab.